Gyrinops walla Gaertn. is the only species growing in Sri Lanka that belongs to the agarwood family, Thymelaeaceae. Although agarwood resin induction and extraction from Aquilaria species of the same family have been practised for many decades in Southeast Asian region, the ability of producing agarwood resins in G. walla was discovered recently. 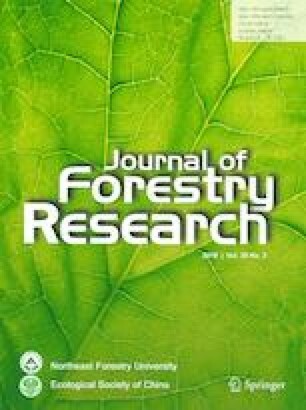 Since previous studies were on agarwood resins formed due to natural causes, the present study was conducted to identify the potential fungal species that are capable of artificially inducing agarwood resin formation in G. walla. Since this is the first ever study conducted on artificial inducement of agarwood resin formation in G. walla, Aspergillus niger and Fusarium solani were selected owing to their high abundance in the naturally formed agarwood resinous tissues collected from 25 G. walla trees. Both fungal species were separately grown in yeast extract glucose agar and used to inoculate healthy G. walla trees under aseptic conditions. Three holes were made for each tree and 2 g of fungal culture including the medium were placed in each hole. Tissue discoloration, characteristic aroma, resin content and resin constituents were checked at 10 cm intervals above and below the inoculation points for a period of 1 year. Results revealed that tissue discoloration and resin content were higher in the trees inoculated with A. niger. Other than at 10 cm above and below the inoculation points, samples collected at all locations had significantly higher resin contents when inoculated with A. niger compared to F. solani. Sixteen agarwood resin constituents, which were also recorded in Aquilaria species, were identified from the discolored tissues using GC–MS analysis. Jinkohol, agarospirol and 2(2-phenyl) chromone derivatives were found in all discolored tissues collected at 10-cm intervals of the trees inoculated with both fungi. β-Seline, γ-eudesmol and valerenal were found in nine of 10 sample points on the stem. γ-Elemene was recorded only in one sample. The characteristic aroma during burning was stronger for dark-colored tissues than the light-colored ones. The present study confirmed the potential use of certain fungal species to induce agarwood resin in G. walla and that A. niger is more effective than F. solani. Project funding: This work was financially supported by the University of Sri Jayewardenepura, Sri Lanka and Sadaharitha Plantations Limited, Sri Lanka.